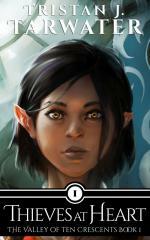 Azria is a mage of Miz, trained to wield the magic her country is famous for. 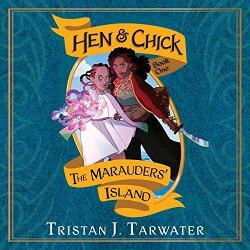 When her estranged mother, alleged pirate Captain Apzana of the Hen & Chick, shows up on her 16th birthday offering her adventure, Azria leaves the life she knows for the promise of riches, renown and danger at her mother’s side. 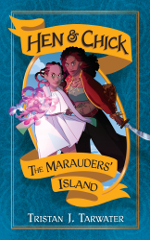 But more mysteries than answers surface when Apzana reveals why she’s called on Azria after years of absence: the treasure of the Marauders’ Island, an island sunk into the Sapphire Sea generations ago by the infamous mage Iyzani. If Azria can raise the island, the score of a thousand shores will be theirs for the taking and she’ll secure her place among her mother’s crew. 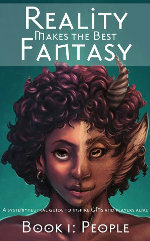 But when Iyzani emerges from the shadows to stop them, Azria must summon her power and navigate the waters of revenge and ambition. A YA novel laced with coconut wine, salt, and magic! Tavera is a child passed from hand to hand as a source of cheap labor in the underworld of the Valley. When she finds herself at the mercy of the vicious sausage maker, the elderly Madame Greswin, she discovers secrets from the woman’s past and the consequences leave Tavera fighting for her life. 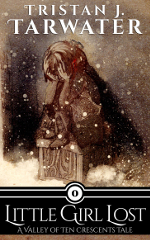 “Little Girl Lost” is a short story and prequel to “Thieves at Heart”, the first novel in the series “The Valley of Ten Crescents”. Born in poverty, a half-elf in a human city, Tavera lives in a world where she doesn’t belong – until the day she meets Derk. Initiated into the elite group of self-made scoundrels known as the Cup of Cream, Tavera must choose between loyalty to her father and a place as one of the THIEVES AT HEART. In this book, author Tristan Tarwater explores the development of a young woman, not as prologue, but as a story all its own – a story of struggle, survival and loss, of the family we’re given, and the family we choose for ourselves. Dershik Cartaskin’s life is one of power, wealth, privilege… and lies. Son to an ambitious father, husband to a wife he cannot love, and father to a child who is not his own, Dershik has everything, and yet nothing to call his own. When the price of power and the weight of lies grow too great for him to bear, Dershik decides to leave everything he’s ever known behind, and makes a deadly choice that will irrevocably alter his future. In this prequel to THIEVES AT HEART, author Tristan Tarwater tells the story of Derk, the man who changed Tavera’s life forever. 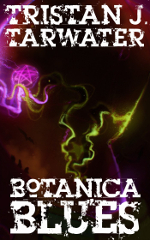 The rise of a deadly cult threatens life in the Valley of Ten Crescents. Alone, betrayed, and on the run from the law, Tavera finds herself charged with rescuing Kella, a priestess with a powerful secret who has been kidnapped by the cult. Tavera finds she can no longer be a little girl lost, but must become a leader and a savior if she is to survive the RED MOON RISING. 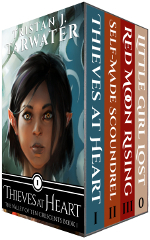 Contains Little Girl Lost, Thieves at Heart, Self-Made Scoundrel, and Red Moon Rising all in one ebook. 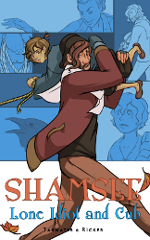 Shamsee’s a small time thief short on common sense. When he crosses The Blighter, a powerful gangster, Shamsee finds himself in debt and in trouble. While calling upon his resources and stumbling across luck both good and bad, the criminal underworld threatens to come out from under him. Business associates, old flames and new flings all want something from Shamsee, and he’s willing to give: for the right price. Songs are sung, jobs are blown and blood is spilled in the quest for A FISTFUL OF LUNARS. 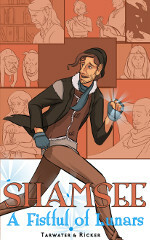 Shamsee is a small time thief headed towards big time trouble. When he decides to bring Blue, a lost child, with him to the city of Oakstand to help con people out of their coins, babysitting becomes the least of his problems. 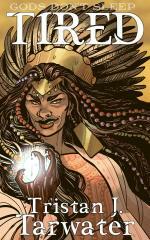 Priestesses, sorceresses and gangsters all have their eyes on Shamsee. Even more alarming is the shadowy figure who terrifies Blue, lurking behind every corner, watching their every move. Can Shamsee keep his young friend safe without losing his head? Find out in LONE IDIOT AND CUB. 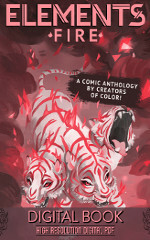 ELEMENTS: Fire is a comics anthology of 23 stories by creators of color from around the globe. With stories featuring peaceful warriors, blossoming brujas, godly hackers, and a fire-breathing dragon boy, we are the main characters of our own stories, not the sidekicks or token characters. This is an anthology that is full of our passions, magic, and inner fire because our diversity is not just a buzzword: it’s our reality! 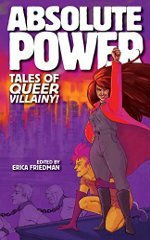 Eisner Nominated Anthology by Creators of Color! A 50 page system-neutral guide to inspire GMs and players alike collecting Tristan’s web column for Troll in the Corner, now with new artwork! Contains the following 9 articles: Antipopes, Courtesans, Friends & Family, Ghosts, Heroes, Monsters, St. Nick & Krampus, Substitutes, & Tisquantum AKA Squanto. As a former soldier and police consultant, Luis Quintana has seen the horrors of war and the brutality of crime on the streets. But when a ritualistic mass murder links an old friend to a lurking supernatural terror, Quintana must uncover a truth he’d thought long hidden, and face a horror he thought he’d long escaped. 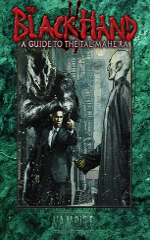 Tristan J. Tarwater breaks into new territory with a bold vision of terror that combines the disorienting cosmic horror of Lovecraft with the modern sensibility of the urban streets. The press of time, the incessant prayers, the bloody magic…can one deity escape it all? A tale of The World of Mun . Tristan wrote the short story ‘Date Night’ in this collection. So what is evil? What makes a person a ‘villain?’ Is it intent to harm…or is it something deeper than that? Each one of the thirteen authors in this amazing collection has taken a completely different approach to answering this question. 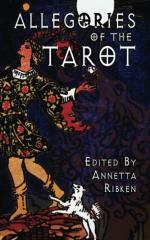 Tristan contributed a short story to this anthology and was presented with the Sun card from the major arcana for her muse. 22 cards…each an individual splinter of the human psyche. 22 writers…honing each splinter into a story of triumph and decay, arrogance and humility. Stories of the brightest lights and the darkest corners of the weirdest minds. 22 cross-genre worlds. 22 portals into the Universal. Only one way to get there. Come with us. Cross the portals. The Universal awaits. 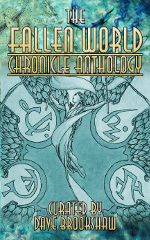 The Fallen World Anthology contains 12 short stories (8 original to this collection) of magic and mystery, in celebration of the second edition of Mage: The Awakening. A prison for souls warped by an Abyss of madness. People Sleep through their lives, never knowing the wonders and terrors concealed from them. 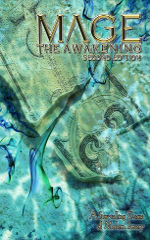 Awakened mages see the Lie for what it is, scratching the surface and uncovering the World of Darkness’ Mysteries. Each is a revelation, a danger, an obsession in the making. 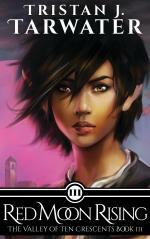 Armed with magic and a need to know, mages confront the supernatural and unexplained. Tristan wrote some of the fiction in this book. 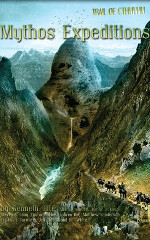 The Mythos Expeditions are a collection of adventures for Trail of Cthulhu, designed to be run as a stand alone with new rules tailored for expeditions or as part of the Armitage Files campaign setting in the core rules. Tristan wrote the module The Jaguars of El-Thar. Professor Henry Rutherford Stapleton of the Miskatonic Department of Anthropology is just west of Chichen Itza, working with local Maya people and a few university students at what he calls the Cenote of El-Thar. He is loath to leave his work behind as he has fostered a relationship with the locals and reports he is on the verge of making a very important discovery. To the northwest, ethnolinguist Galina Avenirovna Prokhorov is studying glyphs found in the Temple of the Jaguar King, suggesting it has some connection with the cenote Stapleton is studying. Hurricane season is drawing to a close and Stapleton has requested several more students to aid him in investigating and dredging the cenotes, ruins, and vibrant villages on the Yucatan peninsula. 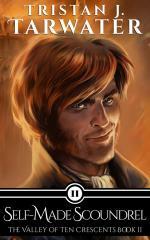 Tristan contributed to large chunks of the book including the Character Creation and Storytelling chapters. 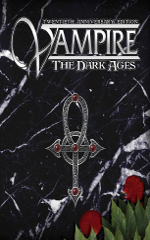 Following the success of the V20 edition of Vampire The Masquerade, Onyx Path is working on their follow up - V20 Dark Ages.